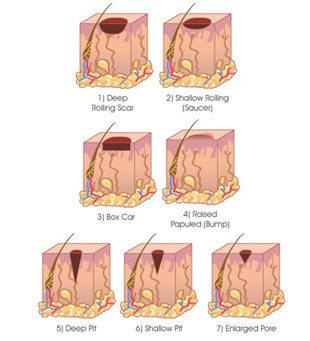 There are different types of acne scars: deep rolling, shallow rolling (saucer), box car, raised papuled (bump), deep pit, shallow pit, enlarged pore. Depressed acne scars are the ones that look like pits or depressions on your skin. This type of scar occurs when you lose fat or muscle under the skin. Depressed scars that give your skin a wavy texture are called rolling acne scars, and scars that look like sharp, narrow indents — that give the impression your face was punctured — are called ice pick acne scars. Raised acne scars, on the other hand, appear above the skin’s surface. This type of scar packs a double whammy — along with becoming larger over time, raised scars can also be itchy and painful. Depending on the skin’s severity, a combination of treatments may be needed to treat your acne scars. US FDA-cleared laser treatments such as Laser Genesis (a collagen-building and skin rejuvenation laser) and Pearl Laser (a re-surfacing laser) gently remove damaged skin replacing it with new, healthy skin. It can also be safely combined with chemical peels to increase the effectiveness of the laser. Another treatment option is Dermapen, a microneedling treatment that treats acne scars as well as surgical scars and stretchmarks. To further reduce acne scars, active acne must also be controlled and treated. Acne can be prevented by using antibacterial and anti-inflammatory cleansers and toners that can purify the pores from impurities and excess oil. Combination of safe skin treatments can also help to further control acne such as Salicylic or Chemical Peel and Laser Genesis.